I’ve watched the New York Yankees/Rockies Nolan Arenado trade rumor develop over the last few days and went through various stages of emotion. Initially I was detachedly bemused at what should have been on a non-story getting legs and starting to spread. Now I realize it’s a microcosm for the new and more often than not terrible state of sports writing on most sites. I believe it was initially in the Martino article that this idea was first floated. The article stated that “people briefed” on the Yankees thinking said they were interested and were having internal discussions about trading for Arenado. Is that too vague for you? If that wasn’t vague enough the next line really grasps at straws “One source says they probably have talked already.” Then the author states he has no confirmation from either side about any of this. At that point he then takes the unsubstantiated and unattributed rumor and uses it as the linchpin of his article including “Frankly it would be surprising if they haven’t talked by now”. So we’ve created a rumor and used that rumor as the foundation of a piece that then tries to sell you on why said rumor makes sense. Three days later Yahoo, CBS Sports, SB nation and every other sports blog or media site is acting as if this was a real thing and the teams were in active discussions. First of all, Colorado was a playoff team last year and has aspirations to be one again this year. Unless Arenado tells them he will not come back to Colorado under any circumstance its unlikely they will trade him. The comparisons to Machado’s situation last year do not fit, as Baltimore was a last place team and was dumping their entire roster. 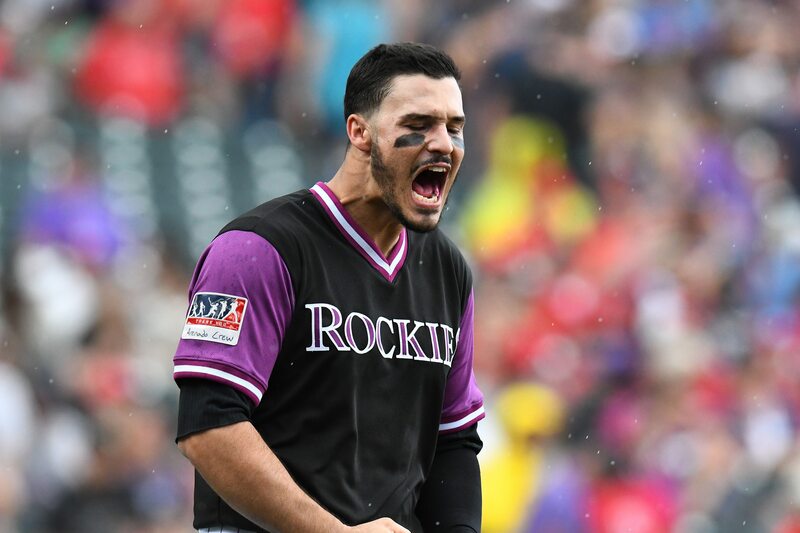 The second thing is that Arenado has expressed a desire to return to the Rockies, an admiration for Todd Helton and Derek Jeter for playing with one team for their entire careers, and an appreciation for what that could do for his legacy. He also has some serious home/road splits and leaving Denver could impact his production as he ages. While he also said he wants to play on a perennial contender, he has not given any sign he thinks Colorado cannot be one. Finally from a Yankee point of view why would you trade assets for a player you can just sign next year if your that enamored with him? Also, are we sure his production without playing half his games in Colorado will be that much better than what Andujar (who is 5 years younger and will be 20 million per season cheaper) will offer over the next 5 to 8 years? Wouldn’t the Yankees prefer to sign Machado, who is younger and proven in the AL east over, Arenado and the questions about his transition from obscurity to the sports largest and most intense media market? Not to mention having to give up Andujar and/or Frazier in likelihood as the centerpiece of the trade. This is exactly the type of trade that Brian Cashman has been refusing to make, why would he go back to it now? It’s fun to make up trades and talk about then with other fans and your friends. You discuss the pros and cons and try to convince each other that your right. It’s another thing to make up a rumor, or to take it and re-post or link to it with no proof and call it news.